I have used and blogged about edmodo before as a learning space for literature discussions. Since our school has gone full speed ahead with Google Docs and Google Site Portfolios, I decided to try and use Google Groups this year instead of edmodo for my Grade 3 Literature Circles. I set up a 3SS Reading Group with our school gmail accounts. The students didn’t have to remember another username/password as they were already comfortable with their school gmail accounts. In Groups, they easily click on the discussion prompt and respond to the questions/thoughts as well as reply to each other. So far this has been successful. I have added our Literacy Specialist as a member of our group so the students are collaborating with others outside our classroom too. The students are able to communicate with each other on the novel we are reading together whether they are in school or at home. For our next novel, the students will take turns posting the initial questions/prompts for the group. 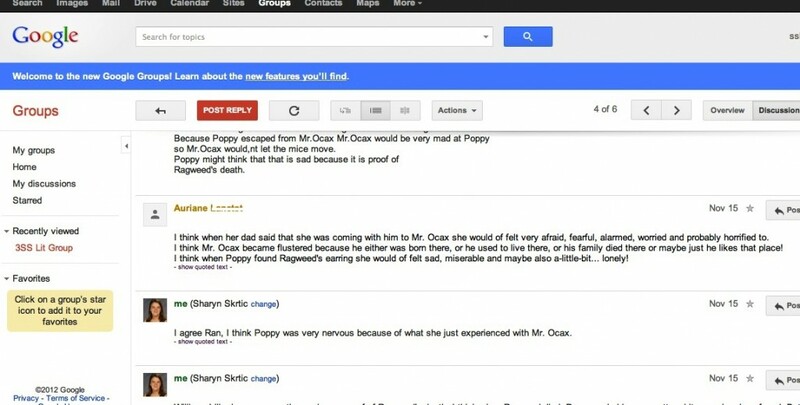 The following snapshots show a few examples of student’s thoughts on our current novel, Poppy by AVI. As always, if you and your students are reading Poppy or another novel and would like to connect, please let me know! This entry was posted in Reading, technology, writing and tagged Google, literature circle, reading, technology, writing. Bookmark the permalink.